Rotary vane air compressors are one of the most widely used products in use today. They serve a wide range of industries, universally providing superior energy savings across many varying levels of air demand. In addition to the necessary air supply they provide, their benefits include greater efficiency at lower costs. Through the use of rotary vane compressors, no matter what the specific industry and/or application, compressed air provides the flexible, critical element to the production process. In fact, compressed air represents over 10% of total industrial costs; for this reason, it is crucial that it is supplied in the most cost-effective, efficient way possible. 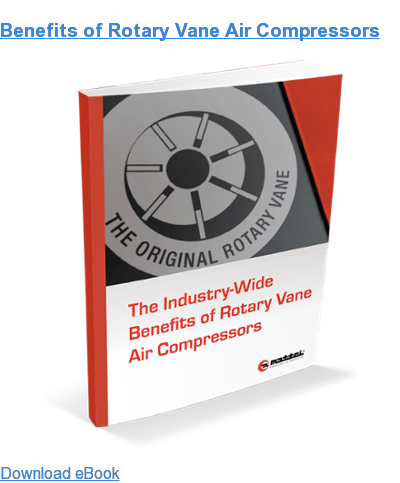 Furthermore, with the ever growing emphasis on energy savings, it is in every company’s interest to use compressed air in the most efficient way—which is precisely what advanced rotary vane compressors do. Here, we will look closely at the overall advantages of rotary vane air compressors, as well as the specific ways they benefit a variety of industries. Mattei rotary vane compressor technology is both innovative and simple: they feature a single off-set rotor supported by two metal Babbitt bushings spinning at 1,800 rpm or less. Blades/vanes slide in and out of the rotor, forming compression pockets, while a zero-wear MeehaniteTM treating process prevents wear to the stator wall or the cast iron blades. The technology is extremely efficient, as well as durable, often providing over 100,000 hours of service life. Alternatively, rotary screw air compressors are both sensitive and complex. They are comprised of two parallel rotors with external helical screws, and each of the rotors are fitted with four roller bearings and two thrust bearings, placed inside a stator made from two intersecting cylinders. The rotars turn with a critical minimum clearance between 3,000 and 8,000 rpm. The use of oil within the compressor causes declining efficiencies outside of the ideal speed range, and installed airend life is typically between 35,000 and 40,000 hours. Therefore, the inherent design of rotary vane compressors is far superior to rotary screw compressors, with unmatched efficiency, service life, and cost-effectiveness. It is for this reason that they are counted on by so many industries, for so many different applications. Beyond their exceptional technology and energy efficiency, what makes Mattei rotary vane compressors so unique is their universal demand; from agriculture to pharmaceuticals, and much in between, countless businesses in a wide variety of industries count on them. Here we will examine their applications and advantages for specific industries. Within the agriculture industry, rotary vane compressors serve a variety of functions. They supply high amounts of continuous compressed air, on demand, for jobs such as operating farm equipment, material conveying, planting produce and milking cows, to name a few. Learn more about the AC Series and why this is the best system for the agriculture industry. Within the automotive repair industry, there are numerous functions for which rotary vane compressors play a critical role. Automotive repair shops, auto body painting shops, and tire and wheel shops use these compressors for welding and cutting, tire inflation, air tool operation, paint pump operation, and a variety of auto finishing tools. They also assist in the operation of air-operated robots, an increasingly common and relied upon technology in auto body shops around the country. For the operators of these facilities, the benefits and ROI are in stark contrast to older systems. The advantages of Mattei rotary vane compressors for the automotive industry start at a very basic level, smaller footprint, pulse-free air, low oil consumption, very little maintenance, and decreased power consumption. Cost constraints in this industry are just as important as in any other industry—as major service centers, body shops, and even local garages are actively seeking ways to reduce operating costs. 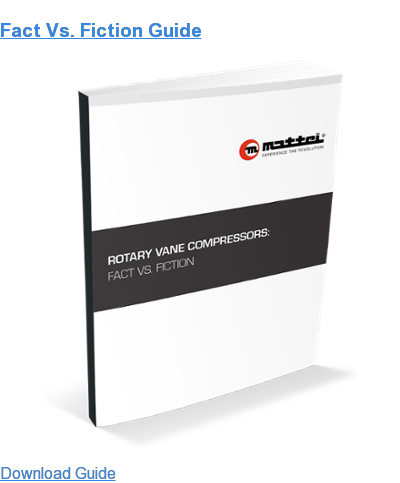 Mattei rotary vane systems are an answer to that need because they are engineered to perform like no other compressors on the market today. Our rotary vane compressors supply the efficient, clean, dry, durable air needed for most body shop and automotive applications, while keeping costs and energy usage down. The many chemical applications used within the dry cleaning environment depend upon accurate amounts of compressed air. Air must be delivered in such a way that clothing is cleaned precisely and effectively, and there is no room for error. The success of a dry cleaning business, no matter the size, depends on this accuracy and quality. In this very competitive service industry, finding the right combination of low-cost operations and high reliability is a crucial advantage. Mattei manufactures the highest quality, most efficient, and quietest compressors that are counted on for their reliability. They are also very compact, taking up less floor space, and Mattei’s innovative design also equates to a very a low maintenance profile. For users in the dry cleaning industry, this means they can concentrate on their core business, rather than on operating systems. Rotary vane compressors not only consume less energy than rotary screw compressors, but ensure the precision and reliability that is needed by the dry cleaning industry. They are the best and only compressor of choice when quality cannot be compromised. As many varied applications and jobs as there are within the energy industry, there are demands for rotary vane compressors. Applications range from compressed air for drilling rigs and platforms within the energy exploration sector, to air pumps for drilling, and turbine operation in sewage, oil, coal, biogas, and waste gas plants and systems. They are also used as a source of energy in the manufacturing of wind generators. 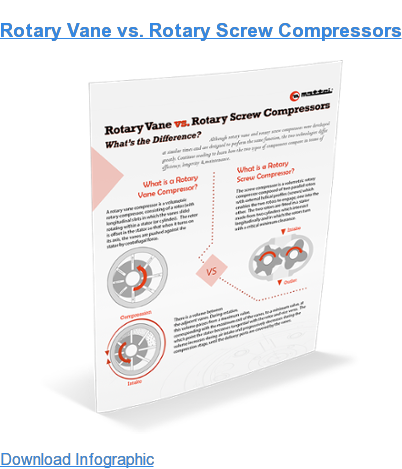 The extremely long lifespan, coupled with uncompromised energy efficiency and cost savings, make rotary vane compressors an integral part of the energy industry. They can withstand and endure the harshest of applications and environments, all the while remaining 100% reliable. Learn more about the Optima Series and Maxima Series and how these systems can benefit the energy industry. Within the food and beverage industry, the applications for rotary vane compressors are practically limitless—as wide and varied as the industry itself. Applications for these compressors include food/beverage product handling, operation of air knives for cutting and peeling produce, handling of bulk products and materials through cylinders and hoists, vacuums in the packaging process, chocolate making, and even the delicate task of filling cakes, pastries and pies. In the food and beverage industry, automation is the key to efficient high volume production. Compressed air is the power behind an endlessly varied range of specialty processes: from the filling of delicate cakes and pies to the making of chocolate and the handling of food and beverage products. They are used in air knives that cut and peel produce, and are used to operate pumps that move and fill liquids. Air compressors ensure the smooth, fast handling of bulk products and materials through cylinders and hoists, and can be used as vacuums during the packaging process. From the beginning to the end of the production cycle, air compressors make the food & beverage industry run. Not only do rotary vane compressors provide the quiet, consistent, reliable efficiency and savings these food and beverage companies need, but they supply air that is completely free of contaminants—an absolutely critical function in the handling of food and beverages. In almost every facet of manufacturing imaginable, no matter what the product or part being made—and no matter what stage in the process—rotary vane compressors are a huge part of the entire manufacturing industry. Rotary vane compressors serve in a variety of welding operations, in the use of air-operated metal and wood working tools, in cylinders used in paper pressing, in many industrial cooling operations, throughout material handling operations, in printing pumps and equipment, and much more. They also play a large role in the use of robotics and automation, which is a major part of today’s advanced manufacturing. Their reliability is second-to-none, and the longevity and superior cost savings help manufacturers remain competitive and at an economic advantage. In so many ways, they are critical to the success of today’s manufacturers of all types and sizes. Rotary vane air compressors are the only compressors that offer the precision, technology, and complete cleanliness that is necessary to every aspect of the healthcare industry. Their reliable, uninterrupted air supply—which is compliant, sterilized, and medical-grade—is used for air-driven medical tools and devices, for breathing air, dental tool operation, medical gases, equipment sterilization, and so much more. Doctors’ and dentists’ offices, clinics, surgical centers, labs, and veterinary offices utilize compressed air systems for countless, often lifesaving procedures and functions. These technologically-advanced compressors ensure the safety, reliability, ad accuracy that is needed by any and all healthcare facilities. Their energy savings deliver the added benefit of keeping costs down, and their long service life allows the focus to be solely on the patient. Gas operations, no matter what the specific job, demand reliability and consistency. Compressed air is often highly preferable in hazardous environments, as it is safe to have in contact with materials. It also provides a harmless, effective way to clean equipment, while minimizing downtime and extending equipment life, and is used throughout a variety of gas operations, including vapor recovery, gas gathering, gas transfer, flare elimination, and in gas turbines. As the natural gas industry continues to evolve and thrive, rotary vane compressors provide the cost-effective, energy-saving, reliable air source that helps make this growing industry run. Rotary vane compressors are used throughout all processes of pharmaceutical manufacturing. They serve to control the equipment used to manufacture pharmaceutical products, as well as to produce nitrogen. Oftentimes, compressed air is mixed with various products to accelerate drying, and serves many functions throughout various chemical applications. The use of compressed air eliminates explosion risks associated with alternative substances, making it especially suitable for volatile environments. In all areas of pharmaceutical manufacturing, air supplied via rotary vane compressors ensures a clean, safe, quiet work environment, making it the only choice for pharmaceutical applications. It’s also the best way to make sure downtime is avoided and energy savings are achieved. Within the plastics industry, there are seemingly endless uses for rotary vane compressors. They play an extremely important role in automation—widely used by the plastics industry today—ensuring accuracy and consistency. Rotary vane compressors are used within the tools used by the industry, as well as in the cleaning of equipment and facilities, throughout material handling operations, along production and assembly lines, and in the operation of plastics manufacturing equipment. Plastics manufacturers require systems that last long and function optimally. Their success also depends on keeping energy costs down, which is ensured with rotary vane compressors. The many advantages provided by the compressors keep plastics manufacturers competitive and successful. Every wood product business, no matter the specific product or final operation, can benefit from the use of rotary vane compressors. OEMs working with wood products, furniture manufacturers, construction companies, millwork operations, and so many more rely on compressed air provided by rotary vane compressors. They assist in the use of air-operated tools, which are lighter and easier to operate than electrically-operated tools, which reduces labor time and allows jobs to be completed faster. They are also the most reliable, effective way to ensure accurate painting and finishing of wood products. No matter the size or specific role of the woodworking task, rotary vane compressors deliver the energy- and cost-savings that keep these businesses running smoothly and profitably. They ensure accuracy the way no other compressor can, and make any woodworking operation more efficient. Due to their superior design and function, and countless advantages—including energy efficiency, significant cost savings, reliability, and unsurpassed quality—Mattei rotary vane compressors are relied upon for myriad applications throughout so many industries around the world. They are simply the best choice for continuous, accurate compressed air. More than 50 years of business has allowed Mattei to serve nearly every industry and market—thereby providing us with the valuable experience that is necessary to fully understand our customers' needs. Our understanding of our customers has significantly contributed to the superior design, construction and performance of our rotary vane technology—and allowed us to engineer the best systems for a variety of applications. We understand your industry, the challenges you face and the solution you need. Today, Mattei is proud to serve a multitude of industries including agriculture, automotive and body shop, dry cleaning, energy, food and beverage, manufacturing, medical and dental, natural gas, pharmaceutical, plastics, woodworking and more.